My office is often invited to set up a booth at trade shows. The problem is, we provide a not-for-profit educational service. We don’t have a budget for trade show promotional ideas (or advertising of any kind) because the adage of spending money to make money doesn’t apply to us. Yet, it’s helpful for people to know we exist. So, when we’re invited to put up a booth, we usually agree reluctantly and then scramble around, trying to figure out how to drive traffic to our booth on the cheap. Most of the time, we buy candy to spread on our table and lure unsuspecting trade-show-goers over. But one of my coworkers recently stepped it up. She took her home popcorn maker along to one expo, along with kernels, some popcorn seasonings, and a bunch of small bags. Voilà! Not only did she provide a reason for people to come to our table, but the enticing aroma of popcorn made people actively seek out our booth. Her ingenuity made me wonder: what else could we do on the cheap to get people to interact with us? I did a little googling and compiled the best tips here. If you have more to add, I’d love to hear from you. With a little thought and planning, a tiny budget can go a long way when it comes to food and beverage freebies. Timbits, Costco sheet cakes, cookies, and candy are fairly economical edible options. Or, if you’ve got the muscle needed, you could install a water cooler for the day. It would be cheaper and more environmentally-friendly than handing out bottled water, and water is often difficult to find in the maze of trade show booths. However, as my colleague Karen demonstrated with her popcorn, aromatic goodies will actually draw people over to you. Setting up a coffee urn is another way to let people’s noses know where to find you. My office may not have a budget for trade shows, but our IT group does have projectors and iPads for loan. Creating a looped slideshow of photos, fun facts, surprising statistics, and your company’s logo and contact info is a great way to capture the attention of people as they walk by. And if you have the funds then try a display solution like the one pictured left. Contests are a popular way to draw visitors right to your booth. Organizing a prize draw is pretty easy, and for a relatively small sum you can pick up a nice gift basket or gift card. Instead of asking people to simply fill out an entry form, you could design a variant of the old “guess the number of gumballs” game. You could make the question about your business, such as: how many clients you served last year or how many products you have in your current catalog. Doing this might also encourage people to chat with you, in a quest to find out the answer. Social media is a great tool in advertising your trade show presence but, used effectively, it can also drive traffic to your booth. 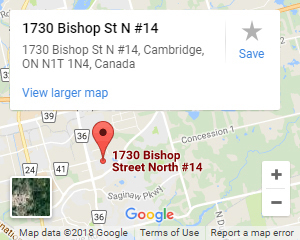 Bartizan Connects suggests that instead of simply tweeting, “We’re here!” try something like, “Follow your nose to the free coffee at our booth!” or “Wanna win a gift card for the best coffee shop in town? Visit us at #ExpoExample2017.” Tweeting live updates like, “We have only 17 Timbits left! Will there be one for you?” might encourage people to make their way over to you. If your trade show or expo has a designated hashtag, make sure you use it; you want your tweets to reach just not your own followers but everyone tweeting about the event. 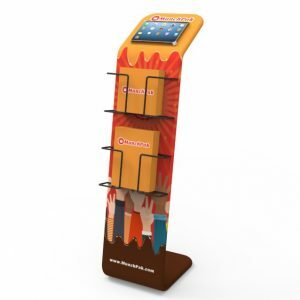 Bartizan has another great idea: create a charging station at your booth. Free wifi at these events is often glitchy and phone batteries drain as they constantly try to reconnect. All you need is a multiport wall charger or two (See below for links), a few universal charging cords, and an extension cord in case your booth’s power strip isn’t easily accessible. As a bonus, people will be your captive audience as they wait for their devices to charge. Trade shows are often overstimulating. Typical suggestions for attracting attention your booth include dressing in loud colours and playing music. For introverts, all the chatter can be overwhelming as well. People might just relish a few moments in your quiet, Zen corner. Try keeping your booth’s background white and bring in a softly-coloured area rug and plants for decoration. If someone in your office has a tabletop water fountain, that would fit the theme well and provide some calming sounds. Serving free tea would be the perfect fit for a Zen booth (and bonus points if you can find a stinky a.k.a. aromatic variety). Let’s face it: branded promotional freebies are part of the fun of attending trade shows and they are effective in their purpose. If you can’t afford to buy lots of smaller promo items to give to everyone who visits your booth, consider spending your trade show budget (such as it is) on a few bigger items that you can use as prizes. There are an amazing number of options for branded products; browsing a website like the ones found on our website will give you some idea of what’s out there. Mugs, USB drives, pens, and tote bags are fairly common freebies, but beach balls, portfolios, and even pet bowls can be branded as well. With a little ingenuity and planning, it’s fairly easy to make your trade show booth stand out so that people visit, even if you’re working with a super tight (or non-existent) budget.